A rub should bring out the steak's rich beefiness, adding complementary flavors and savory notes without overpowering the taste of the beef. A well-executed dry rub requires a bit more skill than a marinade, but has the advantage that you can make up enough for an entire summer's grilling in one prep session. It also helps form a richly flavored crust on the meat as it cooks, which is a definite bonus. Measure 3 parts each granulated garlic, granulated onion and a quality paprika into a mixing bowl. This provides your spice rub with its base, a mixture of savory flavors that complement each other, the beef and your remaining spices. 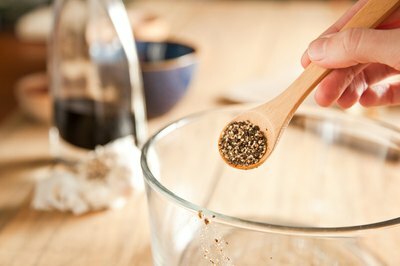 Add 1 part fresh-ground black pepper, or more to taste. Remember that black pepper is very assertive, so it's best to start with less and add more at the end if you feel your spice mixture needs a bit more bite. Alternatively, if you want lots of pepper flavor with a less aggressive kick, substitute white pepper for some or all of the total. Add 1 part each of cumin and an earthy ground chile pepper, such as ancho. Alternatively, add 2 parts of a good commercial chili powder instead. Add 1 part of a smoky seasoning, such as smoked paprika or ground chipotle. If you cook over gas and don't have the benefit of getting a smoky flavor from charcoal, you can double this. Add 1 part fine sugar to round out and moderate the flavors. Whisk all the ingredients in your bowl until thoroughly blended, or pour them into a large plastic bag and shake them until mixed. 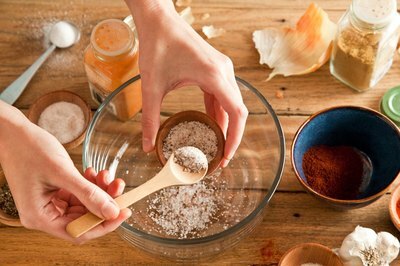 Test your blend by lightly salting a piece of cooked roast beef or chicken breast, then sprinkling it with your mixture. If the flavors are robust and well balanced, the mixture is ready to use. Otherwise, tweak it with additional quantities of savory, earthy, hot or smoky flavors as needed. Keep notes, so you'll know what to do differently the next time. 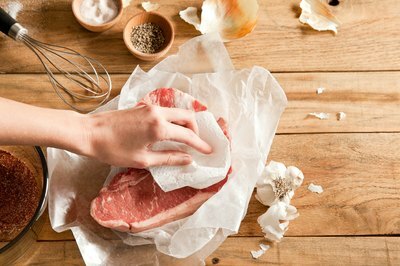 Take your steaks from their packaging or butcher's paper and blot up any excess moisture from their surface with clean paper towels. 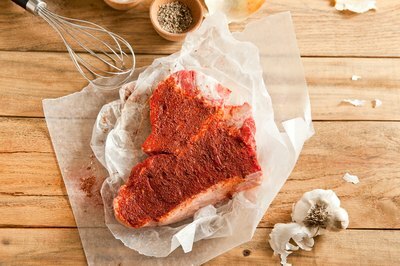 Sprinkle each steak lightly with your seasoning mixture, then put on a disposable kitchen glove and massage the mixture over the entire surface of the steak. Lightly season the steak with salt, ideally a coarse sea salt or kosher salt. Rest the steaks for at least 45 minutes, giving the salt time to dissolve and be absorbed into the beef. 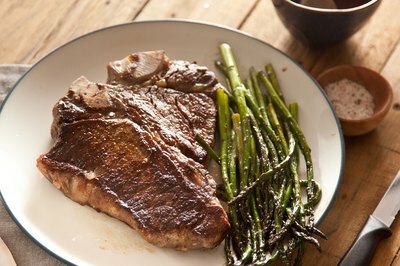 Grill, broil or pan-sear the steaks until they reach your desired degree of doneness. 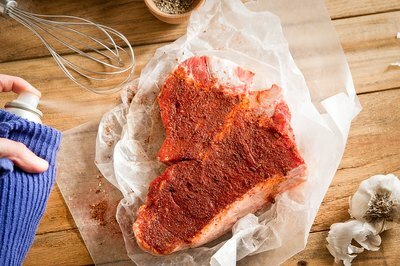 A spice-rubbed steak should be sprayed with oil before grilling, to keep the spices from scorching and giving the steak an unpleasant flavor. • Many other seasonings can be used to good effect, depending on your personal palate. If you like a spicy rub, try adding a small quantity of dry mustard powder for a heat that's clearly distinct from both the black pepper and the chili heat of the ancho or chipotle. For a tart, slightly fruity flavor that will mystify your friends, hunt down a package of ruddy-hued sumac powder at your nearest Middle Eastern grocer. • One tablespoon is equivalent to 3 teaspoons, so in small batches use a teaspoon for the "one part" ingredients and a tablespoon for the "three part" ingredients. 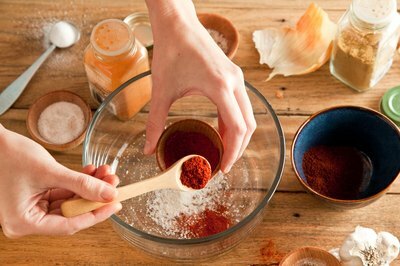 • The success of your spice rub depends entirely on the freshness and quality of its ingredients, so be demanding. If your existing bottles are dusty and sun-bleached, or if you can't remember when you bought them, it's time to buy new ones. Purchase whole ingredients whenever possible, such as cumin seeds and peppercorns, and grind them yourself. Pre-ground ingredients such as paprika should ideally be in a can, rather than a bottle, which provides better protection from the sun's flavor-diminishing effects. • Some recipes call for salt to be added directly to the mixture, but it's usually best to keep them separate. 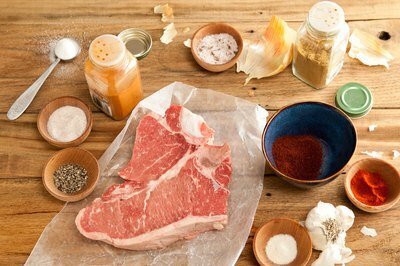 This makes it easier to adjust and re-balance your spice mixture, while separately maintaining close control over the quantity of salt that goes onto each steak. • If it's not feasible to rest your steaks for at least 45 minutes after applying the salt, wait until the last minute instead. 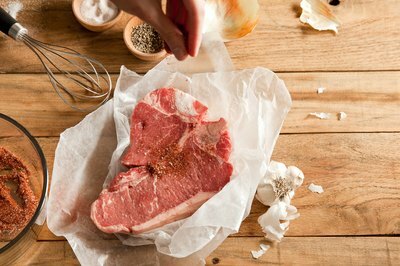 Salt tends to draw moisture from the steak initially, then over the course of 40 to 45 minutes the meat reabsorbs the damp brine. 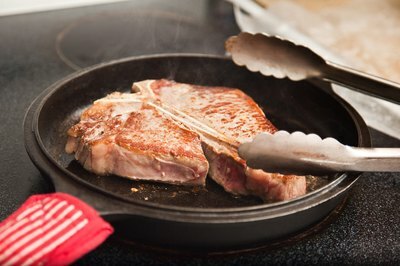 If you salt the steaks early enough to draw that moisture out, but not early enough for it to reabsorb, you steaks will brown poorly and unevenly because of the surface moisture. With a plain steak you can blot it up -- removing most of the salt in the process, unfortunately -- but with a spice-rubbed steak that's not an option.